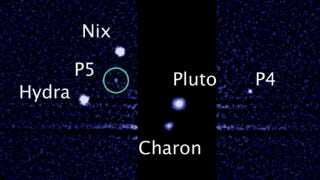 "Vulcan" has won Pluto's moon-naming poll! When we last told you about the SETI-sponsored poll asking the public to help christen two of Pluto's as-yet unnamed moons, "Vulcan" held a significant lead. Now, after weeks of online ballot casting, the namesake of Spock's home planet has been named the clear winner, with a total of 450,324 votes cast since February 11. "Cerberus" came in a comfortable second place, with close to 100,000 votes. Vulcan's towering win is thought to have been spurred thanks in large part to a clarion call issued by William Shatner earlier this month. Have Trekkies taken over the voting on the naming of Pluto&apos;s new moons? The question now is whether "Vulcan" and "Cerberus" will be officially accepted by the International Astronomical Union; the IAU is the organizing body responsible for naming planetary bodies, and will have final say over whether the names are accepted. Fortunately, "Vulcan" has more going for it than its ties to Spock and Star Trek. Vulcan, after all, is the Roman god of lava and smoke, and nephew of Pluto, as SETI's Mark Showalter pointed out in a recent blog post. "Any connection to the Star Trek TV series is purely coincidental," he writes, "although we can be sure that Gene Roddenberry read the classics." Hear Showalter's thoughts on naming Pluto's moons in this recent Google Hangout held by the SETI Institute. Read more at SPACE.com.